The RI-F384 is a panel mounted Multifunction meter (96x96mm) showing measuring parameters that are required for successfully carrying out energy efficiency projects and monitoring the electrical distribution in low and medium voltage networks. (1 and 3-phase systems with a neutral conductor). Ideal for both energy managers and electrical engineers. 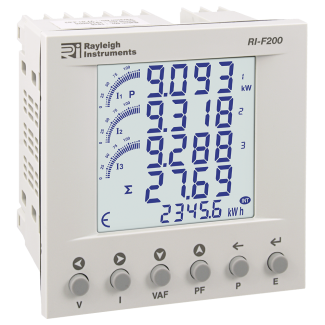 Thanks to its large backlit LCD display the RI-F384 provides clear readings and easy access via the push buttons, and has a bar-graph current indication on every page. +/- kWh (kilowatt) , +/- kvarh, kVah, I (Current), U (Potential Energy), V (Voltage), F (Frequency), P (Active Power), Q (Reactive Power), S (Apparent Power), PF (Power Factor), THD (Total Harmonic Distortion) to the 31st Harmonic. The RI-F384 standard communication options are : Pulse Outputs and RS485 Modbus RTU. 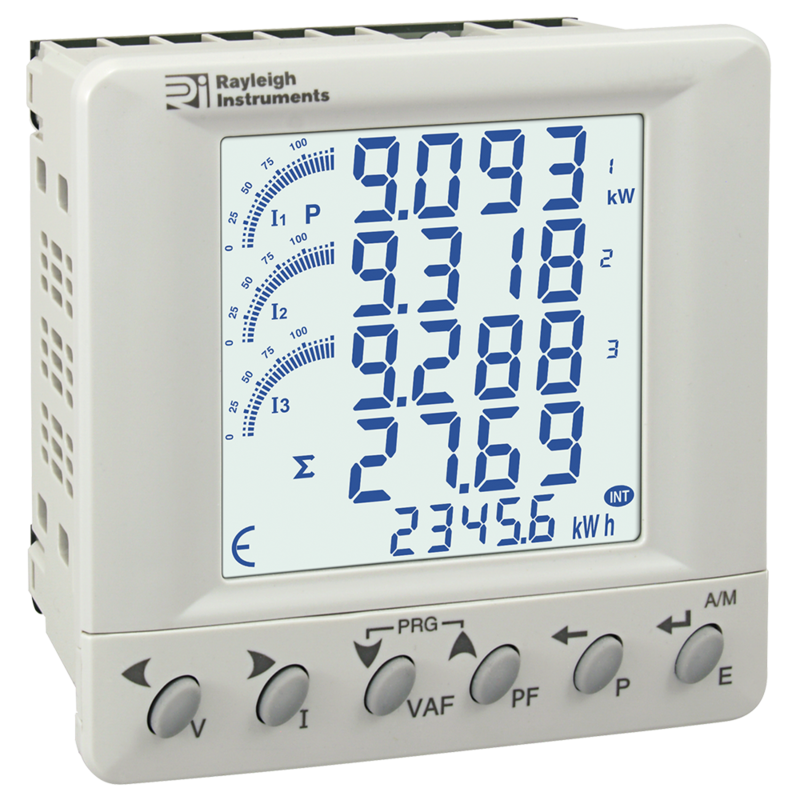 Pulse inputs can be used to record the values for meters such as water, gas and and of course energy meters using measuring devices. Using pulse outputs as a measured value transducer, the working pulses can be transferred to a control system such as BCS, PLC, SCADA systems. Having a RS485 interface with a Modbus RTU protocol enables extremely cost-efficient networking. It features simple topology configuration and a lack of sensitivity to EMC interference. Communication between the sender and the recipient takes place on a wired basis via a sheathed, twisted pair cable. The Modbus communication can be transferred to any control system such as BMS, SCADA. PLC systems using the Modbus registers. Pulsed Output : Voltage range External 24VDC Max.